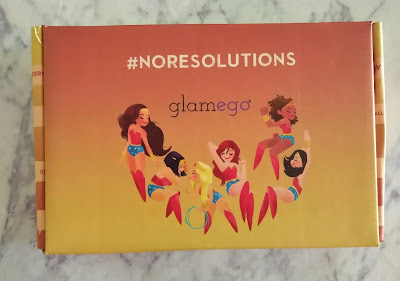 Here is an another Unboxing post of our very loved & affordable Glam Ego box....This one is their January edition! 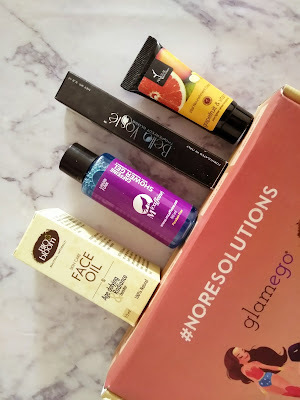 Monthly subscription boxes are a great way to try out new brands and know about new launches and products of various companies and brands, but most of the time they are quite expensive....and sometimes you end up avoiding them and thinking might be its not worth trying...But Glam ego box have changed the game all together, since it is so affordable and the brands they have collaborated with, are of premium and good quality. They are providing beauty products worth INR 2500 for just INR 299/- What else one can ask!!! Moreover, most of the products will be full size and could be used for a respectable number of uses and not just one time use miniature samples!!!! Do check out their website...https://glamego.com/ and order one for yourself. It can also make a great gift to your family & Friends. You can buy one month box also OR 1-3-6-12 month subscription also..There would be a price difference little bit for each plan.. Lets check out what all I receive in my January Glam Ego box! 1. 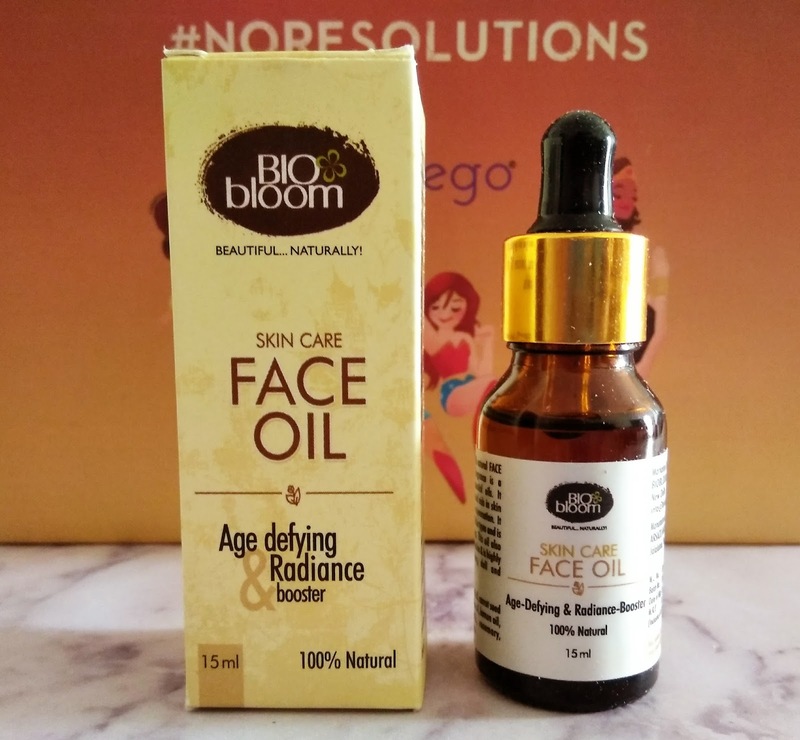 Bio Bloom Face Oil: The first product is from a well known brand Bio Bloom. 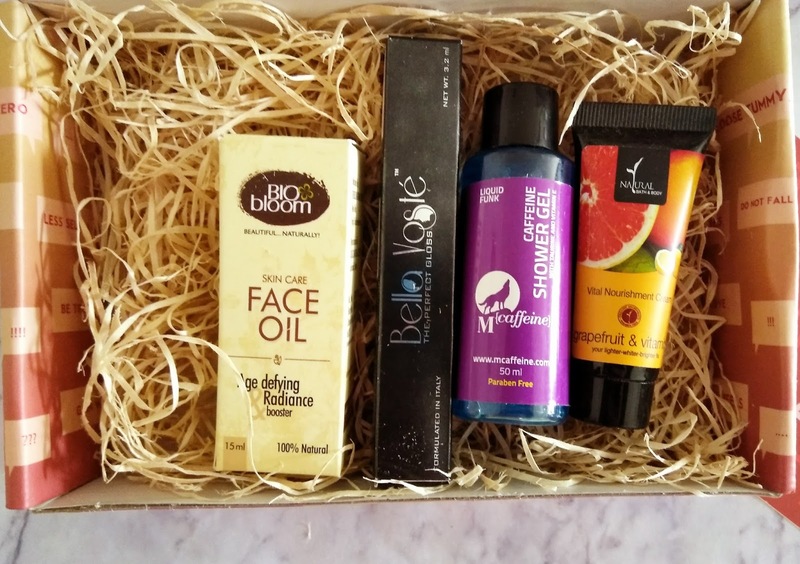 Bio Bloom is one of the top organic brand in the country and they have launched their premium segment product Face Oil. This oil has 100% natural ingredients. Usage Instruction: Just take a drop and rub it on your face for natural glow and it is a best Radiance Booster. They say if you have crossed 18 years, it is the right time to start slowing the process of ageing skin. It seems to be a great oil if you use it before going to bed. However, it can be used in the day time as well.Also, if you have extremely dry skin, then you might use it to hydrate your skin before application of makeup and it will add a nice glow on to your skin. 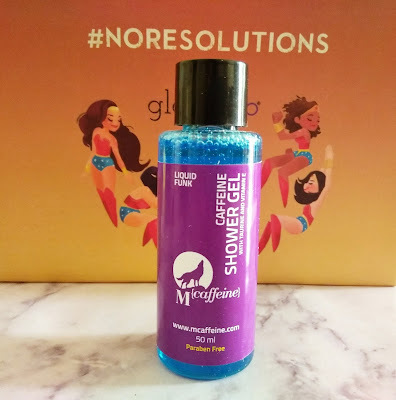 It smells so good and aromatic...I just loved the scent of it and cant wait to use it. The MRP of this face oil is INR 1499/- and the shelf life is 24 months. 2. 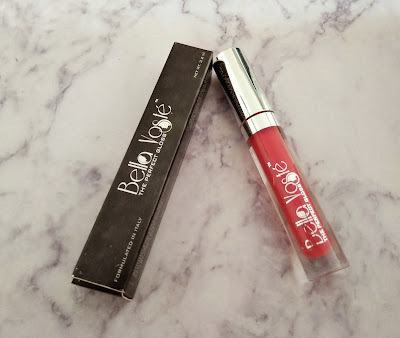 Bella Voste Lip Gloss: The second product in the box is Bella Voste Lip Gloss. I have not tried any of the Bella Voste product before and I am really excited to try this one! It says it is formulated in Italy and gives you a moisturized and plump looking lips. It is a party season & little gloss doesn't harm and also winters really makes our lips dry, so I think this can be an apt product for many of us girls. If you got bored with all those matte lipsticks or want something more hydrating for the winters, this can be a good option to try.. Retails for INR 599 for 3.2 ml and shelf life is almost 2 years. The color I have is Pop of Pink..Although the name suggests Pink, it is not pink color, rather it is bright red (Tomato red). 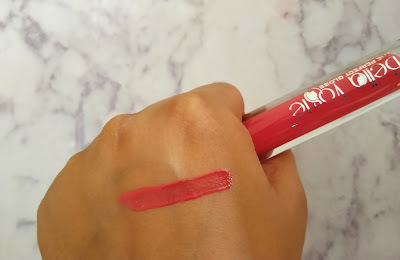 I have a swatch for you guys here....Pigmentation is quite good and not totally sheer like most of the lip gloss...I think it is really nice color lip gloss, which can be used as it is or on top of your any lipstick. Both ways it worked great. 3. 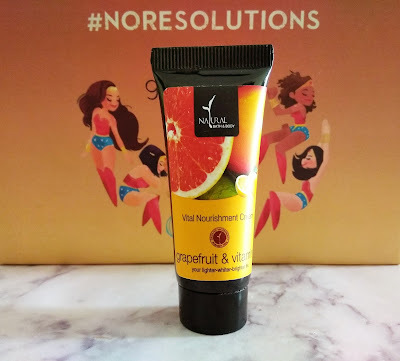 Natural Bath & Body Vital Nourishing Cream: I am the one who always keeps on running out of the creams and lotions.So, the next item here is luckily a cream. It is a Natural Bath & Body Grapefruit and Vitamin C Vital Nourishment Cream. Retails for INR 220. It has a nice fruity scent. Since it has Vitamin C, so it helps to brighten the skin and make your skin even tone. Also, it will help you to get rid of that tan. It smells nice and citrus.. The formula of the cream is quite hydrating...It is not like a cold cream for winters but it does provide some nourishment to the skin. 4.M Caffeine Shower Gel: The last product is a beautiful blue colored shower gel, from M caffeine. M Caffeine is known for their caffeine infused beauty products. This shower gel has Vitamin E, Vitamin C, Taurine etc The color is quite aqua & exotic. I think even the men will like this shower gel since the fragrance is not at all girly or fruity/flowery. It feel more manly and musk kind of fragrance to me.You can smell strong hints of caffeine. It is a Paraben free product. Retails for 189/- for 50 ml of product and shelf life is 24 months. On and all, I am really very happy with the selection of the products in the January Glam Ego box. I liked their December box as well but January box looks even more better and fit to my likes!! Do share your thoughts and feedback in the comment section below. 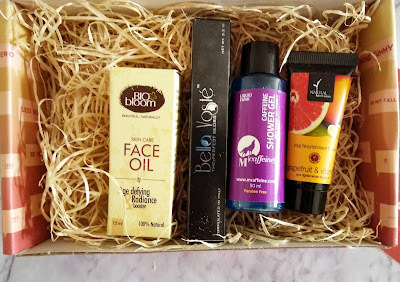 Have you tried the glam ego box yet..If not, it is worth trying once if you love to experiment & try new beauty products. Till my next post, Be happy and Stay Beautiful!!! Your imformation is good, and i go to check your website glamego.com. your product so nice and i feel prices are low.